I’ve been refined sugar-free for six days now! I’m feeling happier. I think there are two reasons: 1. Sugar causes mood swings and 2. I’m not hating on myself for sugar binging or not acting in integrity with what I want to be: healthy. The cravings haven’t been too bad. I did eat a lot of dried fruit and nuts the first few days, and I’m eating more dairy than I usually do (which is barely any). But I’m ok with that! 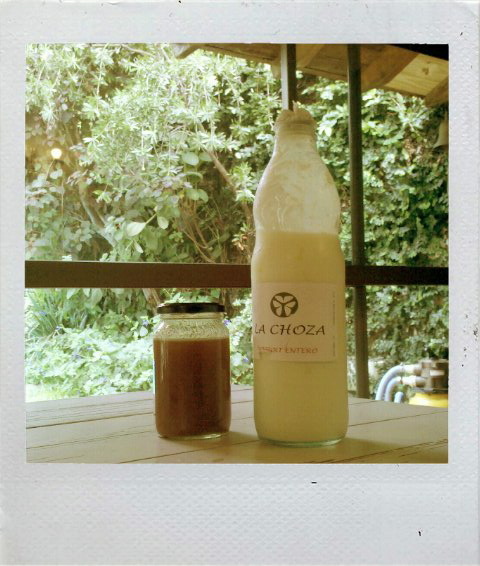 Argentine Yogurt and Honey, fresh from the farm. Unfortunately, according to one of those honey sites, the answer to the question “How much honey can I eat every day?” is NOT “Eat as much as you can.” Damn. “While Jonathan was passing through the woods during the war against the Philistines, he found honey dripping on the ground; he plunged his spear into it, and ate enough to restore his lost strength. He was, however, sentenced to death because he ate honey on a day of abstinence”. So, this next part has nothing to do with sugar or honey, but… Well, actually, it does, in a roundabout way. “All those paths lead to one answer “we are all one and our only job is to be unconditional love and remember”. So, to tie this all together – I’m pretty sure Frank was eating way too much sugar. I haven’t seen the entire movie yet, so maybe honey even played a roll in his transformation. I think we’d all do a little better with less sugar, more honey! *If you are getting your honey from Walmart, Target, Cost Plus, Sam’s Club, Walgreen’s, Rite Aid, CVS, or individual packets from Smucker’s, McDonalds or KFC, there is a 70-100% chance that it’s not actually honey, as defined by the food industry (containing pollen), and could be watered down with high fructose corn syrup. Trader Joe’s honey, thank goodness, is legit. Or rather, I’ve swan dived off the wagon, face first, mouth open, into a kiddie pool filled with liquid dark chocolate. And cashews. And caramel. And peanut butter. And cheesecake. Since January 1st of 2011, I have been going through a cleansing process to break old habits of eating. Not the lemon-water-cayenne-pepper type of cleanse, but a whole/natural/unprocessed/organic foods type of cleanse. I’ve been eating mostly fruits and veggies from Farmer’s Markets, supplemented by hemp milk and dried lentils from Trader Joe’s. Little to no refined sugar, processed foods, dairy, red meat, and absolutely no caffeine or alcohol (except for a cup of decaf coffee – it was gross, even though it was Intelligensia – and a splash of wine out of a a roommate’s 2-week-old bottle that I put in some soup I was making for dinner guests). I could count on one hand the number of times over the past 40 days that I’d eaten refined sugar. It started with a free lunch. The VP at our company owed me lunch – I forget why – so I opted for Tender Greens in Culver City. Tender Greens is one of my all-time favorite restaurants. I’m not sure if it’s the mashed potatoes or the price point or the fact that the produce and meat is sourced from a farm in Oxnard, but I just love me some TGs. They also have some of the best desserts in LA. So that’s when the slide began. I got a cookie. A delicious oatmeal cookie with chocolate chips and pistachios. Pistachios!!! The cookie was huge, round, perfectly crispy on the outside. Amazing. That’s it! I thought. Not another grain of refined sugar for at LEAST a week! I bought a sampler, with one of each flavor. I systematically destroyed the six truffles over a 30 minute time span – as I strolled down the street, as I perused an art gallery, as I drove home with the top down in the sunshine. Oh yeah – I also polished off a (small) bag of their Maple Nut Munch, with 72% dark chocolate, Maple Pecans & a touch of sea salt. That’s it! I thought. SERIOUSLY this time, not another grain of refined sugar for at least another week!!! The next day I ate super healthy – fruit, veggies, leek & sweet potato soup. But then… then my roommate’s friends came over to have a Grammys party. And a huge glossy fruit tart from Whole Foods. I hadn’t had pizza in about 50 days at this point, and I hadn’t had more than a few tastes of cheese on the occasional salad. I caved. I don’t feel like I ate THAT many slices of pizza, but I was in pain for about an hour and a half afterwards. I’m guessing it was my stomach trying to figure out how to digest the huge globes of low-quality (and probably hormone-laden) cheese I was gulping down. Then there was the fruit tart with the sandy buttery crust that I love so much. I may have had two slices of the fruit tart. Monday I think I actually made it through the day without sugar. Tuesday, however, I had another slice of the leftover fruit tart (it was a friend’s birthday! ), and then I actually dug into giant box of Lemon & Raspberry Cheesecake Factory Cheesecake that’s been in our freezer for a few weeks (I did not eat the whole thing. Thank god). Today was the doozy – I went to Trader Joe’s, and my willpower buckled completely and I bought myself two kinds of chocolate – Soft Peanut Brittle, which is rather like a less dense Butterfinger, and Dark Chocolate Covered Caramels, which are actually a bit too chewy for me. That didn’t stop me from eating a few handfuls of each before dinner tonight (I did also give away 1/2 of the Peanut Brittle to the parking attendant as I left the garage – I like to brighten the attendant’s day). So, that’s where I am. I am utterly failing at the No Refined Sugar part of my challenge. But you know what? That’s ok. Along with my discipline challenges, I am also practicing self-acceptance and self-kindness. I could beat up on myself, be mad at myself, be disappointed, but instead, I’m going to let myself eat chocolate for a bit. When I’m ready to stop again, I trust that I’ll stop. I also realized today the main reason behind why I have been binging like this – my period is a week late. No baby scares here, unless it’s the immaculate conception of the second coming of Christ. Actually, I’m certain it’s because I had some female friends spend the weekend at my place the week before last, and at least one was on the rag. My body syncs up with pretty much any woman’s cycle if I spend more than a few hours with her – I once didn’t get my period for two months when my closest female friend (and neighbor) got pregnant. So, I’m fighting against the power of biology and whacked-out hormones. Additionally, I’ve noticed that my body tends to go into binge mode anyways if I lose any weight, which I have what with all the fruits and veggies I’ve been eating. It’s a bit annoying, but I can’t blame my body for trying to protect me from what it apparently interprets as risk of imminent death. I’ll take these chocolates I bought from Trader Joe’s with me to work tomorrow to divvy up amongst coworkers. Hopefully I’ll be able to go hiking this weekend. Maybe I’ll try doing some eating meditations when I’m tempted to bing again. And most importantly, I hope my hormones even out soon. If they don’t, I may need to invest in a larger pair of jeans. A friend asked me the other day what I do to get so much energy. I’m 36 days into my Clean Eating Challenge. I’ve dropped intoxicants (alcohol, caffeine) and severely limited refined sugars, processed foods (including bread), dairy, and meat (when I do eat meat, it’s chicken). I really feel like my body needs less sleep now – I’m guessing less recovery time from the stress you create in your body by eating foods your body isn’t made to process. My skin is so much softer and clearer. My memory is better – I realized recently that I now remember people’s names after hearing them one time (that one’s pretty strange), and I find I can remember everything without having to write it down (I’ve started shopping without grocery lists). My sense of smell is sharper. I have fewer emotional lows. My psoriasis is fading. The pea-sized subcutaneous cyst that I’ve had on my neck for a few years is almost entirely gone (when I put the paste my Ayurvedic doctor gave me on it it shrinks, but I have to keep that up or it returns). What I AM eating is foods from Farmer’s Markets. I no longer shop at Whole Foods due to their policies on Genetically Modified Organisms and Monsanto, and I’ve been to Trader Joe’s about 3 times this year. I’ve started to get to know my Farmer’s Market vendors in Santa Monica and Beverly Hills and Culver City, and they’ve started cutting me deals! Last weekend I made my Leek, Sweet Potato and Pear soup, with Ginger Asparagus Quinoa with a Carrot Ginger sauce on top of that. I’m also eating a lot of Bolani (available at both the CC and BH markets). Bolani is my new favorite thing – it’s like a quesadilla made with super-thin naan-like tortillas, and instead of cheese it’s stuffed with lentils or pumpkin or spinach or potato (the first two are my favorites). When I need a sugar fix, I eat fresh melt-in-your-mouth dates. If you have a sweet tooth and you’ve never had fresh dates, you need to try them. Last year I meditated about 6 days a week; on the 1st of 2011 I made a 100% commitment to daily meditation, and intend to keep that for the rest of my life. Some days it’s 15 minutes, and some days it’s an hour. Some days it’s in my room, some days it’s on my porch, some days it’s on the beach. Like eating clean is clearing out my body, I feel like meditating is clearing out my mind. Science is proving that meditating is exactly like working out. Your brain is a muscle, but instead of physical strength you’re building focus and clarity. Ideas flowing to me. I do yoga two days a week; I run a few days a week as training for a 1/2 marathon I intend to complete in May; I try to talk a walk every day either during lunch or after dinner, and I try to hike on the weekends. We all know that, paradoxically, exercise energizes you. In 2011 I’ve been practicing saying No to energy drains. Energy drains like intoxicants and refined sugar and sub-optimal foods, but also energy drains like people, or like doing things I don’t REALLY want to do. I’m simply being honest with people – everyone – including my boss. If I don’t want to do something, I tell them. If I’m not available to talk to them on the phone about their problems, I tell them. I make it clear that it’s not personal and my saying no is not a reflection of how much I do or don’t value them as a person or as a friend; but I’m just getting more real. It’s so refreshing, and I’m finding out that it works better for everyone. I wake up crazy early because I’m EXCITED to get up!!! I want to meditate and write and create! I want to read empowering and inspirational quotes on Twitter! I want to come up with ideas and work on co-creative projects with people I love working with! That could be #6: co-creative projects. I am working on awesome, fun, inspiring projects, (outside of my day job) with about 6 different partners right now. These are projects I’m doing just because I WANT TO, but working with another person keeps me moving forward when, if I were trying to do it by myself, I might give up. I’m hoping that eventually I will be able to support myself I know that soon I will be able to support myself doing things I love with people I love. That’s my #1 goal. Create my perfect day, every day. And with these small steps, create my ideal life. So, this is where I think I’m getting all this energy. Join me? Challenge Updates: Last month my goals were to buy all of my fruits and veggies from Farmer’s Markets, eat pretty much vegan during the week, and only have refined sugar every other day. I got through the month entirely on FarMar produce – no New Zealander apples for me! Seriously, everything just tastes better (cucumbers actually taste like cucumbers, and the snozberries taste like snozberries) and I’ve started getting deals from the vendors I see regularly, which is awesome. I also discovered a new vegetable called Sunroot (or Sunchokes or Jerusalem Artichokes). I thought it was ginger and bought some, then luckily overheard an Italian chef telling a woman it wasn’t ginger. I started chatting with him in Italian (Ciaaao sei un cuoco? Ma che cazzo sono queste cose?) and he told me how to prepare them. I’ll let you know how it goes! I did pretty good on the veganism, but I totally failed on the sugar-every-other-day challenge. I’ll partially blame that on the huge tin of Danish Butter Cookies in our office. Abstinence is so much easier for me than moderation! So I’ve decided that practicing moderation is going to be a focus of mine in 2011. Speaking of abstinence, I also took a week-long Facebreak – no checking Facebook. It was easier than I thought it would be, and was, surprisingly, awesome. It was such a RELIEF not to be checking Facebook. I use FB as a distraction and procrastination tool. So, the majority of the time, when I’m on FB, I’m judging myself and feeling like I SHOULDN’T be on FB – I feel like should be doing something more productive. Like working. Or writing. This ends up with me feeling bad or guilty about using FB. So not checking it at ALL got rid of all those negative thoughts and subsequent icky emotions. I felt better, I got more stuff done, and I felt like I had less mental clutter. My friend China was the one who inspired me to do a week-long Facebreak with her, and she wrote a wonderful, detailed blog about it, Fifteen Reasons for a Facebreak. We both enjoyed our Facebreak so much that we decided to extend it to 21 days, to cement the change in our Facebook usage habits. We’d both like to use FB more as a tool and less as a distraction. A friend of mine made the comment, “Facebook’s not a drug,” but actually, it serves the same purpose as a drug – distractions & addictions are both things that disburse your mental energy and are used to cover up underlying emotions that you don’t want to deal with. Additionally, I’ve figured out that Facebook is to Relationships as Fast Food is to Healthy Food. Facebook and Fast Food are quick, convenient, and filling for short time. But they usually leave you feeling unsatisfied. Fast Food does not nurture your body; Facebook does not nurture your soul. It SEEMS like you’re connecting with your friends, but the interaction is so shallow and one-sided that you aren’t really. Facebook is never going to give you what you’re actually craving – a REAL connection with the people you care about. It’s just shallow friend clutter. I’d rather focus on building my Core Relationships – the 10 or so people who I really love and care about and who are true friends – via face-to-face interactions or at least talking on the phone. I’m Addicted to Dates. And I think we should eat Insects. No, not those kind of dates. It really is an annoying name for a fruit. Every time I want to talk about them, I feel like I have to explain myself. Dates. I just recently discovered them. Around May 1st, to be precise, when I started my 30 Day Ayurvedic Diet Challenge, and No-Refined-Sugar Challenge. Dates are one of the few fruits I’m supposed to eat according to Ayurveda (along with figs, apples, pears and persimmons – that’s it), so I decided to buy some at Whole Foods. And I liked them. A little too much. I started eating 5, 10, 15 a day. Probably too many. Last Saturday I was at the Santa Monica Farmer’s Market and I came across a booth with SEVEN different kinds of dates. I bought a bag of Medjool (same as Whole Foods) I was shocked when I tasted them. They were SO MUCH moister and sweeter than the WF dates I’d been getting. The difference totally blew me away. I mean, I thought Whole Foods carried quality stuff. But these dates were AMAZING. No comparison. Delicious. I’ve been trying to shop at Farmer’s Markets more often, and I’m hoping that I’ll get to the point where I shop almost exclusively at FM’s. This date experience has really encouraged me to work toward this goal. I’m not sure if the bag I bought at the market was a pound or half a pound. I hope it was only half, because I ate the whole thing in 24 hours. I really don’t think I need to be ingesting a pound of ANYTHING in one day. The funny thing is, almost every time I pick a date up (THE FRUIT), it makes me think of a cockroach. Obviously the resemblance isn’t strong enough to gross me out, but it’s still there. I actually believe that we should start eating bugs again. Yes, again. Do you realize that all primates eat insects? They eat bugs in Asia and South America. Our repulsion to eating insects is purely cultural. Insects are all protein, no fat. Insects are the most numerous life forms on the planet (aside from bacteria). They’re also cleaner than the other animals we eat – they don’t get the swine flu, or avian flu, or E. coli. You can’t get food poisoning from bugs. And I just did a little research on diseases – the only insects that transmit diseases are the ones that feed off of humans and human waste. Isn’t that kinda funny? It’s like we’re the impure ones that make ourselves sick. So yeah, the only disease-spreaders are mosquitoes, ticks, cockroaches and house flies. Obviously, these aren’t the kinds of insects I’m talking about. We’d be eating crickets, meal worms, cicadas, ants, larvae, worms. Insects are cleaner and cheaper and more eco-friendly than any other edible animal out there. If you had to do it, would you rather slaughter a cow, or “slaughter” a cricket? Animal rights activists don’t care about ants. And lobsters are arthropods, same as insects. Why is it ok to eat a lobster in the United States, and not a cricket? Why? Think about it. I mean, seriously think about it. Get past your conditioning and squeamishness and look at it logically and objectively. Maybe we’re moving in the right direction. I get the feeling that I’ve gotta step up my game though. I’m sure I’ve eaten an insect as a novelty, but if I really believe this (which I do), I’ve gotta walk the walk. Lead by example, right? All right. I found one. A restaurant in Santa Monica that serves insects. This article give a good overview, and pictures! Scorpion pizza, yum! Who’s going with me?????? ?